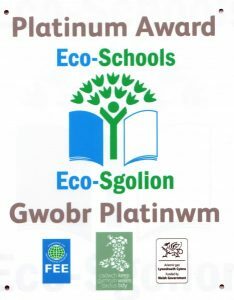 Cradoc is a Platinum Eco-School. Being an eco school means being green in as many ways as possible. We have litter picks, we compost our food waste, we recycle our paper, we save energy and water and we take care of our school environment. Each class has Eco-reps who often come together to take part in special Eco events. Well done to you all and we look forward to your advice in continuing to improve our school now that we have our Platinum Award.